One of the greatest things about the current gaming climate is how diverse video games have become. There’s no shortage of different gaming experiences to check out, but there’s nothing that leaves me satisfied the way that a traditional turn-based RPG does. It’s always special to skillfully make your way through a dungeon by outwitting enemies, and that’s exactly the experience that Airship Syndicate is offering up with Battle Chasers: Nightwar. I didn’t know much about the upcoming role-playing game before I got to go hands-on with it, but I was immediately won over by the game’s gorgeous 2D artwork. Everything from the very eclectic characters that formed my party (I controlled a giant robot, a girl wearing boxing gloves and a swordsman) to the aesthetic of the dungeon I was roaming around looked great. It didn’t take long for me to stumble across some angry skeletons to battle, and that’s when I got to get a taste of Battle Chasers‘ combat. Anyone who has played a turn-based RPG in the past will have some familiarity with how Battle Chasers operates mechanically. Battles are a turn-based affair, with players selecting between standard attacks and abilities that cost mana to use. Each member of my party had a different role (the giant robot could heal, while the girl could cast support buffs), and I quickly dispatched the easy enemies after a few rounds of action. While the combat in Battle Chasers: Nightwar is very traditional in nature, there are some fresh new ideas that help give it a unique personality. One of the coolest quirks is that players will gain an overcharge of mana during a battle. I was told this was implemented so that players would actually use their abilities during combat, as the development team saw that players were hesitant to use any moves against weaker enemies. Since the overcharge will disappear once the battle ends, there’s no reason not to experiment with each members’ skills. Beyond gaining mana, players will also be building up another meter during combat. This one applies to the entire team as a whole, and allows characters to unleash extremely powerful moves that are accompanied by a gorgeous cutscene. Up to three bars of this special attack meter can be stored at a time, and each character has different skills that can be activated (with some taking just one bar while others use up all three). This adds a ton of strategy to matches, as successfully managing this meter can be the difference between failing a battle and emerging victorious. I got to see first hand how important this gauge can be when I took on a powerful boss. The boss constantly did around 60 damage to my characters with its devastating attacks, and I planned the whole fight around building up my meter to three bars. My plan was to use my swordsman’s level three attack, which was set to do a tremendous amount of damage. The fight was mostly a back-and-forth affair, and things started to look dicey as my mana dropped to a low amount. It was then that my strategy finally paid off, as my meter filled, and I was able to defeat the boss with an awesome attack. It was a thrilling fight, and if I hadn’t built up my meter then I probably would’ve lost. 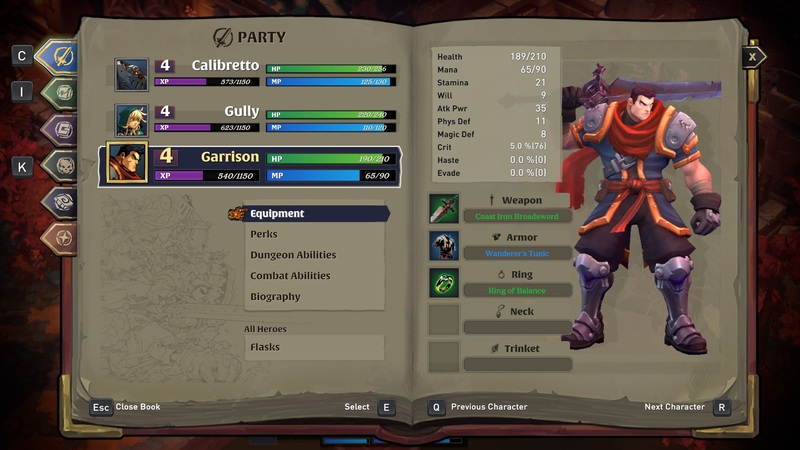 Beyond the highly polished combat system, Battle Chasers is also adding some unique ideas to its dungeons. The main story dungeons will all feature certain randomized elements, such as areas where the player can fish (who doesn’t love fishing mini-games?). One of the coolest randomized parts I found was a chest that I could put an existing piece of gear in. After I put it in, the chest teleported to somewhere else within the dungeon, and if I found it again I would get an upgraded piece of gear. This adds a risk-reward mechanic to exploring dungeons, as it isn’t a guarantee that the player will be able to find their loot again. There are also crafting and bartering systems in place, although I didn’t really get to see much of these in action. Either way, it’s cool to see some new ideas incorporated into what is otherwise a very old-school feeling game. I walked away really impressed with Battle Chasers: Nightwar. Airship Syndicate has created a fundamentally solid role-playing game that implements some fresh ideas while sticking to the genre’s tried and true roots. Learning that it won’t be a lengthy affair filled with fluff (It’ll run around 15-20 hours) further cemented my interest, and it’s nice to see that a turn-based RPG that really respects the player’s time is coming later this year. Battle Chasers: Nightwar is set to release October 3, 2017 for PlayStation 4, Nintendo Switch, Xbox One and PC. Previewed on PC and Xbox One.